This is something that is – for those that know The Lego Car Blog – right up our alley, and it’s also something we’d like to see on every LEGO set… although it’s probably quite unlikely! 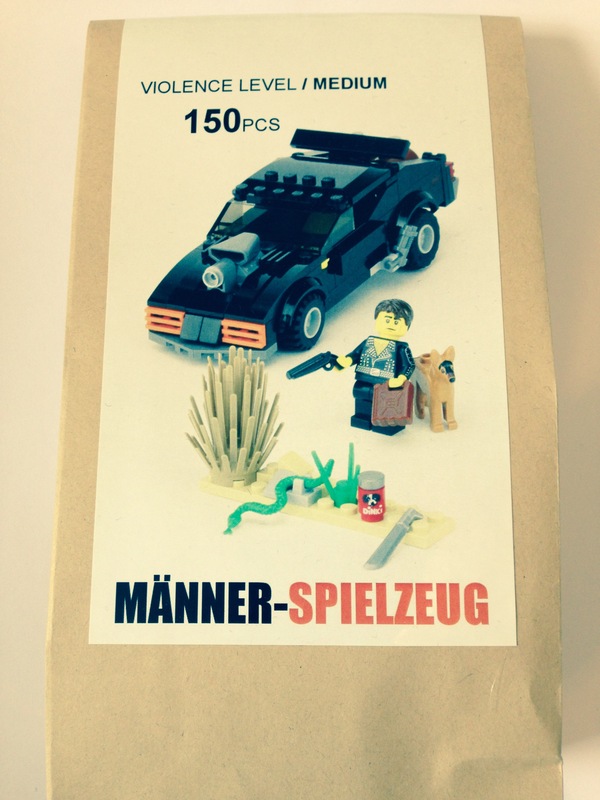 The guys at Manner-Spielzeug have a few custom sets available, in themes that The LEGO Group are unable – for sound ethical reasons – to explore. Our set comes from the original Mad Max movie, and features Max’s famous V8 Interceptor, a mini-figure Mel Gibson, and a host of the coolest parts possible. The genius behind the Manner-Spielzeug products is that they use the very best pieces from all available sources, whether that’s LEGO themselves, third party accessory makers, or their own print-works, to make the sets that LEGO can’t. The Interceptor set comes with 150 pieces, neatly packaged in a tough brown paper bag (which is both cool, and green – a solution that surely toy companies should be exploring themselves). 147 pieces are band new official LEGO parts, whilst two come from third part accessory wizards Brickarms, and one is an official LEGO brick enhanced with Manner-Spielzeug’s own print. 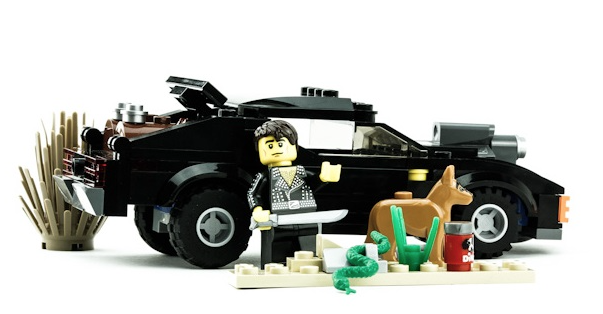 Included in the official LEGO piece count are a dog, snake, bush and gas-can, as well as the neat Mad Max mini-figure. The instructions come in digital format, with a QR code included so that a simple scan with a smart phone can bring up the PDF, which is optimised for multiple device types. This is worth bearing in mind as although it’s unlikely to impact anyone reading this review it may restrict builders for whom the Interceptor is bought as a gift. The instructions themselves are very nearly as good as LEGO’s own, being logical, neat and clear. They do perhaps lack a few sub-assemblies when compared to those from an official LEGO set, and this does make the build slightly more challenging than you might expect. However for us this made the familiar ‘spot the difference’ between the part built model in our hands and the part built model pictured in the instructions a more fun experience, and certainly didn’t detract from an enjoyable build. 36 steps later and the finished model proves to be excellent, being both true to the Mad Max movie and gloriously playable. The Interceptor is a comparable size to LEGO’s newer vehicles at 6-studs wide, and features a removable roof, detailed engine with supercharger and some trunk space for the aforementioned gas-can and Brickarms weaponry. The two Brickarms pieces are well suited to the set, and the real surprise was Manner-Spielzeug’s own printed part – a can of Dinki Di dog food from the movie – which is of a quality as high (if not higher) than anything LEGO make themselves. Overall the Interceptor is something of a delight. It’s different from anything that LEGO produces, but is totally true to LEGO’s ‘Play Well’ ethos. Only with a bit more violence. Perhaps the only sticking point is the price, as for €69 (just over $75/£50) the piece count is quite low. The quality however, couldn’t be higher, and if you’re a fan of the Mad Max movie franchise we expect you’ll find little better than this. 4 stars – Highly Recommended. You can check out the Manner-Speilzeug Mad Max Interceptor set by clicking on the link below, where you can also read more about their mission and view the other products that they have available. Let them know we sent you and you can take advantage of a 10% discount too.